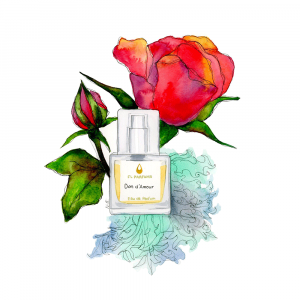 I am a self-taught illustrator from London and explore fragrances through watercolour and mixed media illustrations. Whilst not a proper synesthetic by any means, I do visualise fragrances as colour and texture, to try and better understand their character. 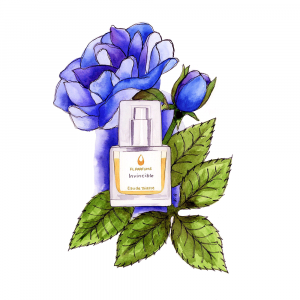 My signature style includes depicting the main notes of a fragrance within the illustration and often draw inspiration from botanical illustrations. 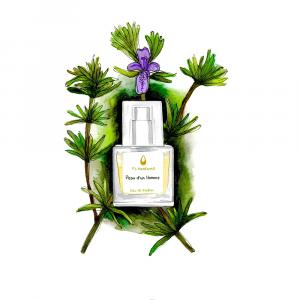 The illustrations I have created for FL Parfums are inspired by the all-natural ethos of the brand, taking cues from botanical style illustrations, featuring notes found in the fragrances. I have kept the lines and form of the notes as organic and natural as possible, with the bottle being illustrated in a simple way; focusing on trying to capture the ‘feel’ of the fragrances rather than being as realistic as possible.